Roadless Forest in danger in Rocky Mountains | "Global Possibilities"
A vast stretch of roadless forest high in the Rocky Mountains of Idaho. Lush, alpine river valleys just a few hours from Seattle. The wild, rocky coasts of Maine. Right now, Congress is considering a package of bills that, together, would permanently protect close to 1.5 million acres of amazing wild places like these. Email your Senators and Representatives today and tell them to protect these majestic landscapes. We all know that gridlock in Congress is a serious problem. In fact, Congress hasn’t passed any legislation protecting wilderness in over three years. In that time, we’ve seen Big Oil, Gas and Coal get bolder and bolder, attempting to drill, frack and mine their way through our public lands. This year, Congress has the opportunity to turn this around by pulling together these bills into a huge package of public lands protections. These proposals were offered by members of both parties and enjoy bipartisan support. But it’s still difficult for good bills to see the light of day in this gridlocked Congress. That’s why your Senators and Representative need to hear from you – if they support a package of historic wilderness protections, you’ll have their back. This proposed omnibus wilderness bill would give greater protections to public lands in 12 states across the nation. One of these places is the Organ Mountains of New Mexico. These desert mountains are extremely diverse, and are home to species that don’t exist anywhere else in the world. Unfortunately, they are also threatened by mining and urban sprawl. Passing this legislation would protect these amazing mountains from the worst damage. All around the nation, the oil, gas and coal industries are trying to open our public lands to be mined, drilled and fracked. But with this important legislation, some of our most special wild places can be protected for future generations. 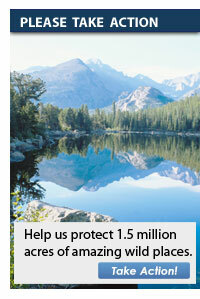 Take action today to protect 1.5 million acres of mountain, desert, shoreline and forests for future generations. Thank you for all that you do for our wild places. You received this email because you have previously supported the Sierra Club’s efforts and/or expressed interest in future communications from us. We appreciate that you have chosen to receive email from us. If, however, you received this email in error or do not wish to receive future emails like this, use this link to be removed from this type of email contact. 85 Second Street, 2nd Fl.